When my father was eight years old he stepped onto a rattlesnake barefoot. I don’t know the details – was it a sunny day during a summer drought, with golden dust rising like prayers under his feet as he walked through the Georgia fields? Was he in jeans (they called them dungarees back then) or overalls, or was it on a Sunday when his mother had forced him to go to Southern Baptist church wearing a pair of nice slacks and a collared shirt? Was he happy that day? Was he exploring or playing, full of childish joy? Was he hiding from playmates, from his younger brother, his cousins? Was he running for the supposed shelter of home under imminent storm clouds? Or was he roaming the woods, avoiding his abusive father? Had it already started, at eight years old, the trauma he’d spend a lifetime trying to heal from? The last 10 years of his life he spent in a wheelchair after Guillain-Barré syndrome left him paralyzed. For most of those years he fought for his independence with strength, humor, and a kind of courage the finest words I can string together could never describe. He was one of the bravest people I will ever meet. But he was terrified of snakes – all snakes, not just venomous snakes. He could not watch them on television or visit them in zoos. Once he found a baby snake in our yard while he was mowing the lawn, and after a wild dash to grab a garden hoe, several barbaric shrieks that rattled the neighborhood’s suburban propriety, and two full minutes of violent thrashing, the tiny reptile was hacked into pieces and left for my mother to deal with. Somehow, my father did not pass his phobia of snakes on to me. I was never scared of them, not even as a child, a bright blessing when you grow up around the swamps and mangroves of Florida. I owned a garter snake in college and my father let me keep it when I was home for the holidays – in a terrarium in the garage. I earned a B.S. in biology and handled snakes and even baby alligators the summer I taught science camp at a local natural history museum. The Eastern Diamondback is one of my very favorite reptiles. 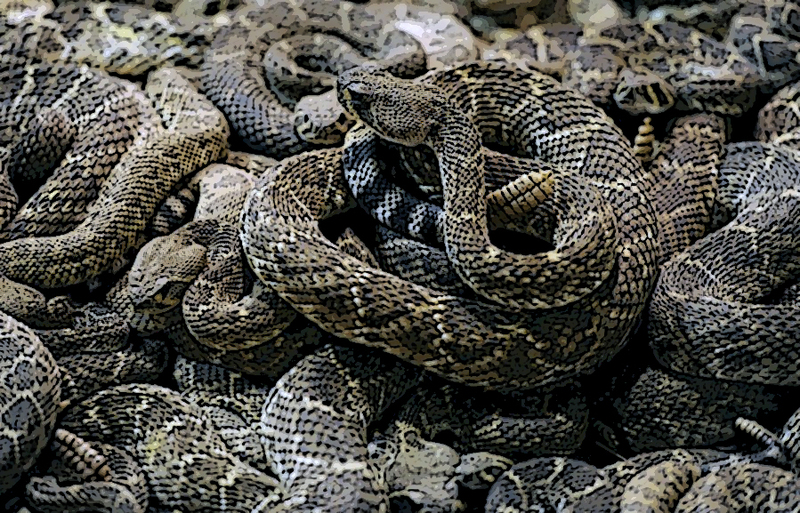 Rattlesnakes and other vipers are a cuddly bunch – they tend to share the same den, especially over winter. Female rattlesnakes give birth to live babies and share the duties of raising them. They rarely fight; at times males may dance around each other for access to mates. 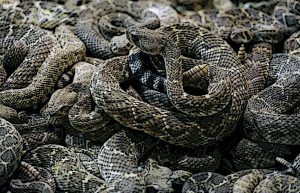 And rattlesnakes are capable of recognizing their littermates years later, showing them greater affection than just any-old-snake they encounter. But that is science and animal behavior; it’s the sinuous, sinister beauty of the rattler as she moves that makes me love her. The cautious flick of all-knowing tongue, the natural wisdom in the hooded, cat-slit eyes. The way she takes her camouflage to such exquisite extreme, her impeccable scales like shiny glass beads that cover muscle and spine and turn her body into diamonds. Evolution was an over-achiever with this snake, and that’s before we get to the snare-beat of her rattle-tail warning system, the sweetness of a beast who asks you to leave before she bites. It’s almost cruel that a being I admire so much is the same kind of creature who caused my father a lifelong fear, another childhood trauma that affected his physical, emotional, and mental health throughout his lifetime. He lived a full life, he loved, he conquered, he helped people heal their own traumas, but he died early, and I know in my soul it was because he could not get the healing he needed while he was still alive. 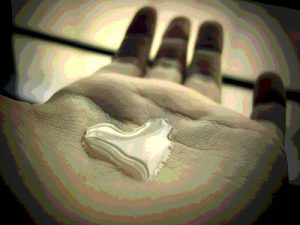 Two weeks after his death I was almost home, my car ascending the last mud-chasm of the rugged dirt road before it smoothed into sugar sand, curved, and became my long driveway. Thirty feet in front of me there was a dark line stretched across the bright white road. I slowed the car, then stopped. 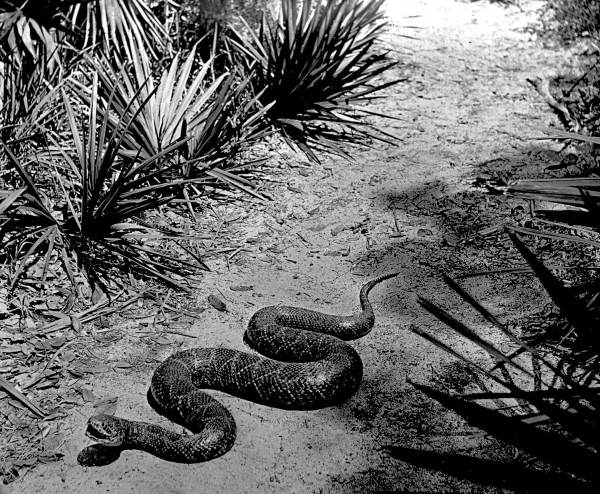 Photo of a Florida rattlesnake in the 1920s courtesy of Florida Memory. The long, thick line moved, just a foot or so, that motion unmistakable. It was a snake. I eased the car closer and leaned forward. Rattlesnake. There was no mistaking that patterned back. This was years before I owned a smart phone, and so I sat in awe, nothing to reach for, just living in that moment until she slid into the woods so quickly my greedy eyes could barely follow. 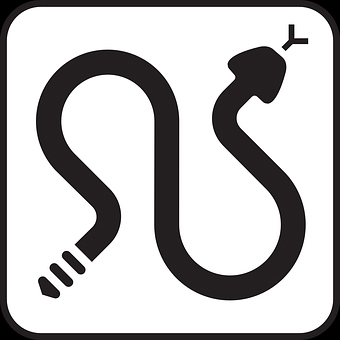 In the days that followed I was sure the snake had been a sign from my father. That he loved me. That he was more than ok, wherever he was. That he was healing from his trauma and could send me a rattlesnake to communicate his progress. Maybe I’m kidding myself, or maybe it’s true that my brain is hardwired to find God. Maybe I needed to believe something about my father and looked around until I found it. 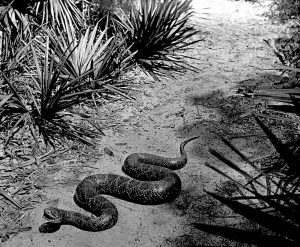 After all, in the 10 years I have lived in the woods I’ve seen a total of three rattlesnakes (and two black snakes, half a dozen oak snakes, a dead scarlet king snake, and one juvenile water moccasin). But it feels so good believing in my Dad’s indomitable, indestructible spirit, and that his love for me would allow him to return to me, for just an instant, knowing that my own wellbeing was caught up with his. I’m ok with the fact that this might all be illusion (or delusion). My mosaic of beliefs doesn’t require me to be right – as a matter of fact, I’m counting on God being so huge, vast, and all-encompassing that I cannot possibly understand or conceive of her entirely with my big, meaty brain. I know in my bones, my mind, and my spirit that when emotional trauma can’t be healed it works its way into the body and causes physical illness. 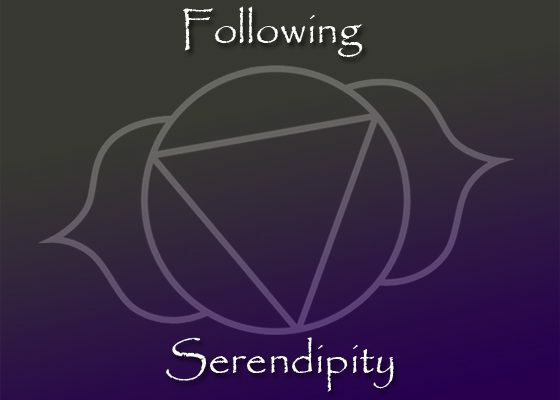 I believe that we have lessons to learn, issues to work out, recurring patterns of energy and psychology we have to work through over and over through more than one lifetime. I can feel the lifetimes laced together like 450 feet of woolen yarn curled inside of a baseball, whether we realize it is there or not. And this is God to me, something I sense, and explore, and discover in my physical life; in the love I have for my husband and my family and my friends and my dogs; in the best and worst of all my own experiences; suffusing the natural world around me. In the usual places, like sunrises and sunsets, but also in the scaly belly of a Diamondback Rattler, who is too beautiful, too terrible to not be a sign from the Divine. Thank you. This was beautiful…. Kim this was great. Learning something new about your Dad. He was an amazing lovable and very much missed friend. What a great story. John and I miss him so much.